Motorized sliders are brilliant tools for filmmakers and time-lapsers. Unfortunately, just as with cameras, there is no one perfect motorized slider. This overview is a rundown of what currently are the best portable, somewhat affordable, motorized slider options on the market, and can be used as a comparison tool. The article is continously updated to be as relevant as possible. It was last updated February 18th, 2016. The list is sorted alphabetically. Feel free to leave feedback as comments below or use the contact form. The Cinetics slider was funded through a Kickstarter campaign. Its most distinct feature is the ability to use three axis operation, when fully equipped. 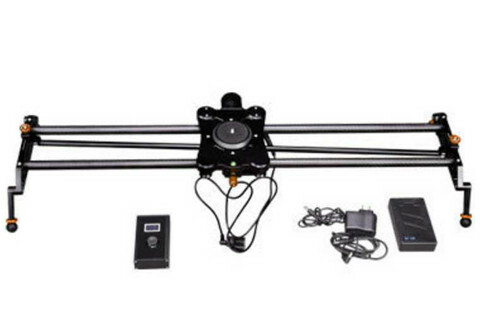 The slider consists of four 16 inch rods where two and two rods are mounted in parallel into a 32″ (81 cm) unit. The axis360 ut is also available as 64″ and 96″ options. The axis360 can slide up to five kilograms of camera vertically. Cinetics specify the product weight as 10lbs (4.7 kg). 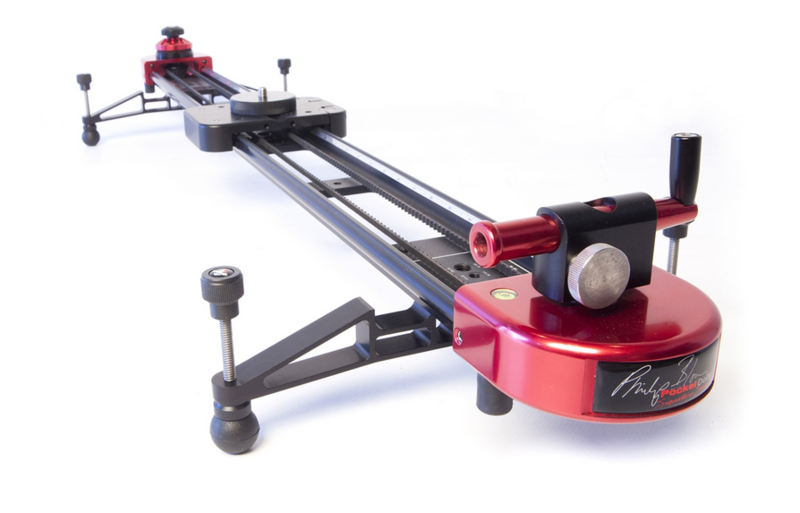 The DigiSlider 2 Axis Auto-Pan is the newest addition to this list. The design seems to take cue from the Dynamic Perception and Rhino sliders with a carriage mounted to carbon fiber rods. The belt is outside and the motor sticks out. The Auto-Pan is offered in two lengths, 80 cm or 120 cm. A set comes fully equipped with the slider, a medium speed motor, camera cables, a battery, and a controller offering both real-time motion and shoot-move-shoot. Panning is made possible by utilizing an extra rod. With regards to muscle, it is rated for pushing 5 kg horizontally and lifting 3 kg vertically. The slider weight is specced to 1.2 kg for the 80 cm version, but the truth is that it weighs double that (all included, as pictured to the right), and 3,2 kg when adding the bag. DigiSlider Auto-Pan is on offer for $500 for the 80 cm length, while the 120 cm version is out of stock as of this writing, with no pricing info given. The Dynamic Perception Stage Zero slider is a classic. DP has also released another slider, the Stage One carbon fiber slider. Both can be fitted with a huge range of add-ons, including a system for three axis operation. The latest to the system addition is app iOS/Android app control. Dynamic Perception probably offer the most comprehensive motorized slider system, suited for anyone that wants every option right now or wants to start with a system that can grow as needs arise. The most basic Stage Zero slider bundle, excluding a controller, is $750, while a Stage One bundle with both motor and controller starts at $1,325.00. Then start adding. While rock solid, the trouble with both Dynamic Perception solutions is bulk. The Stage-slider are quite big and a bit complicated to assemble, reducing portability. The edelkrone slider’s foremost feature is that it uses a system that gives it reach beyond its physical length. This is quite brilliant, but has both advantages and disadvantages. On the plus side it packs better than most sliders, and is light. The downside is that it does not motor vertically, and stability can be an issue as it can only be mounted to a single tripod. 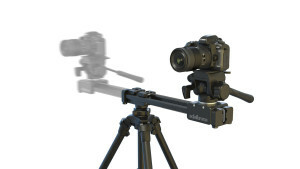 The edelkrone slider is available as 1.3′ (400 mm), 2′ (600 mm) and 2.6′ (800 mm) length version. The three SliderPlus Pro versions are 10 cm longer than its respective normal versions. 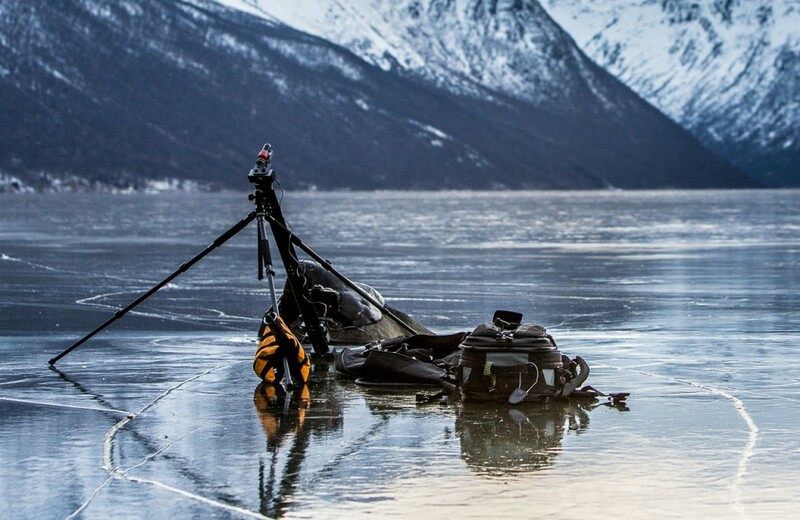 Be aware that the SliderPlus only can travel its full length when mounted on a tripod, not when put on the ground. 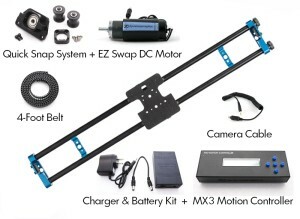 The edelkrone has easily attached add-on options for motorizing in two axis. Product weight ranges from 3.3 lb (1.5 kg) for the smallest to 5.02 lb (2.28 kg) for the longest Pro model. Add another 2.9 lb (1.3 kg) for the ‘Target’ module and/or 1.7 lb (0.8 kg) for the ‘Action’ module. Compared to the other motorized sliders, the SliderPLUS is maybe the lightest and smallest option. The smallest slider sans options is about $450 (when in stock). The longest Pro version, with both the target and action modules, adds up to no less than $2200. There are also quite a number of reports of quality issues for the edelkrone sliders, probably as a result of the complicated design. 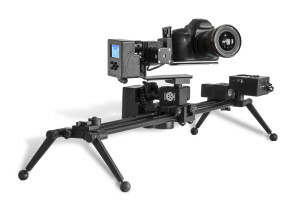 The iFootage Shark Slider S1 with the S1A1 single axis motorized option. Photo courtesy of Gear Contact. The Shark Slider S1 has a celebrated pulley system that sets it apart from most other sliders. The weight pulley is a non-motorized solution, though. Unfortunately, while the S1 slider is pretty compact and light weight, the S1A1 motorized option is expensive, heavy and bulky. 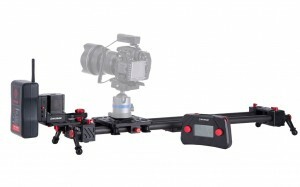 The Shark Slider S1 sans motor is reasonably priced at about US$640, while the single axis motor system adds no less than US$1480 to the price tag. To be fair, it is a rugged and wireless motor system. However, as the only motor option for the Shark slider, it is way too expensive. Three axis operation is not available at the moment of this writing, but is planned. The Kessler Philip Bloom Pocket Dolly in red, without motor. Photo courtesy of Kessler. This is one of the first options that became available on the market, and still is a solid contender. There are numerous options available both for dress and length, and no less than six motor options, ranging from 50:1 to 1000:1 speeds. A standard size (41.5″) model costs about US$1100, while a one motor add-on with a basic controller is an additional US$600. Add US$200-250 per additional motor, and US$1000 for the advanced controller. Kessler also offer other sliders. Konova offer a range of different sliders, called the K1, K2, K3, K5 and K7. All but the K1 can be fitted with a motor system or be bought with motor system bundles. The Konova range use rails of their own design and ball bearings carriage. The Konova sliders can be bought in lengths from 60 cm upwards to 200 cm for the K5. The list of configurations, with different motors, motor types, and other add-ons is exhausting. For ‘traditional’ sliders, the Konova range is probably both the most complete and of the most affordable. The ‘bare bone’ ‘economy’ K2 slider cost only $189, while the three axis motorized ‘K7 smart bundle’ is $1,229, with the option for adding even more cost/accessories such as a carrying bag or different geared motors. Just like the edelkrone slider, this brings its own, ingenious functionality to the table, unfortunately at the cost of vertical movement. 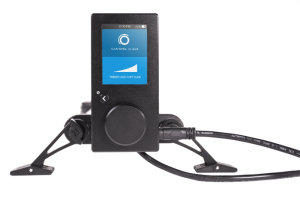 The notable feature is that the PMG-DUO is reversable, thus offering both a linear and a curved track in one package. The motor options moves by a rubber wheel from the carriage, and with that excluding vertical motion. The dual sliders are available in four different sizes, 24 inch (60 cm), 32 inch (80 cm), 36 inch (90 cm) and 48 inch (120 cm). The shortest cost $700, the longest $900 and the two others something in-between. Making the Duo slider motorized adds another $550 to the tab. 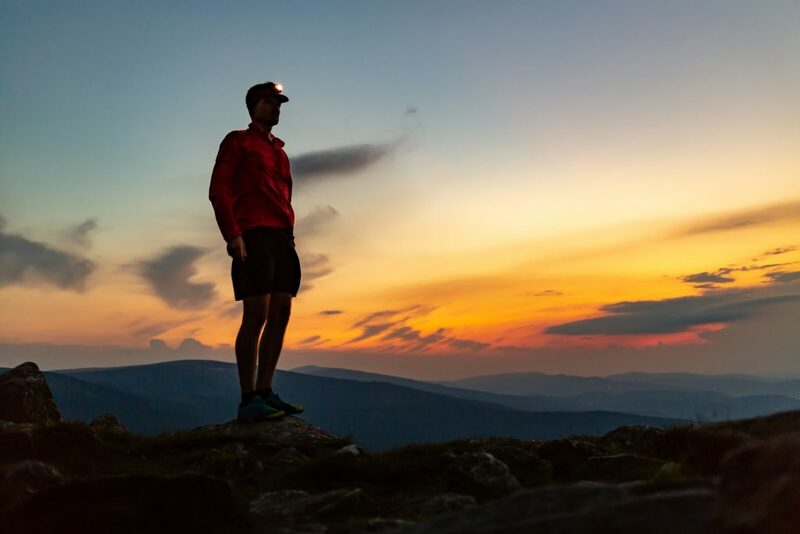 The Rhino Evo slider started as a Kickstarter funded project and has proven so popular that as of this writing, the slider has only been available as pre-order, as Rhino can not produce fast enough to cover the demand. The Evo has a motor option, a flywheel option and a parallax option. The Rhino slider is a rod system offered in two different lengths, either as carbon fibre rods for light weight or steel rods for strength. The choice of lengths is 24″ (60 cm) and 42″ (106 cm) for both materials. The cheapest Evo sans options is $449, while an 42″ Evo Pro Motion bundle is $1,149. A motorized Cinevate Atlas slider is approximately $4,000. That is too pricey to be called even somewhat affordable. DitoGear sliders are known to be solid pieces of equipment, with emphasis on solid. All DitoGear sliders are large in one way or another, and as such not portable enough for this list. 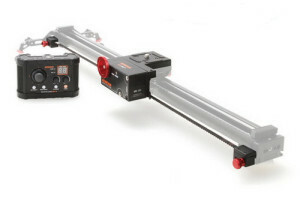 Glidetrack, numerous other manufacturers and a lot of DIY projects are based on the IGUS rails. Glidetrack offer both dry and ball bearing carriage options. The Syrp Genie is a motor that can be used with Syrps own Magic Carpet slider, or any other slider. The Genie is moved by a string that can extend longer than you’ll probably ever need. Varavon is comparable to Konova, only with less options.